Sailing is simply the best way to see Croatia. You can charter a yacht from TheBigSail.com and explore Croatia’s many archipelagos and beautiful coastal islands. You don’t need to be experienced either, you can choose to charter a boat in Croatia with or without a Skipper depending on your level of experience. Croatia has a Mediterranean climate, with long, warm summers. The average temperatures for Croatia in the summer months from June – October are in the 20’s – 30’s (°C) – who could resist that? Croatian cuisine is excellent, and a proud part of Croatian culture. It is unique, varied, fresh and delicious. Along the coast the food is influenced by the best bits of Italian cuisine, with fresh seafood, mediterranean vegetables and fantastic cheeses featuring heavily. Although not commonly known for it’s wine, Croatia also boasts hundreds of different wine producers, so you can always be sure for a nice glass of wine as a reward from a day’s sailing. We’d always recommend drinking something locally produced – usually very good value and all part of the Croatian experience! Not only is the water stunningly turquoise – the average sea temperature is a minimum of a nice, warm 22°C from June until late September, and peaks in August at a glorious 25°C, so even those of us who usually stay clear of the water won’t be able to resist a nice warm swim! Summer in Croatia means festival season. Croatia’s music festivals have earned a reputation for drawing world-famous acts to incredible venues. One of the best known festivals in Croatia, Hideout Festival, is this year celebrating its 5th year and hosts its events on the beaches of the island of Pag, and Ultra Europe hosts a week of music across several locations including Split, Hvar and Vis – all on The Big Sail 2015 route! 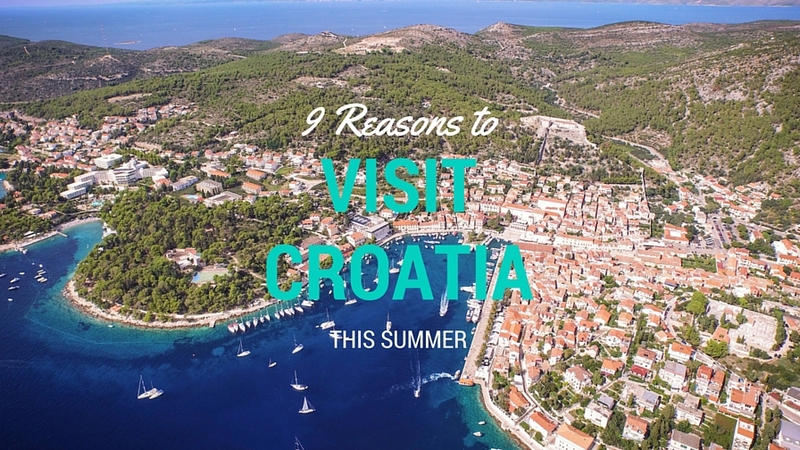 Why not combine a yacht charter holiday with a Croatian Festival experience?! From disused cold war submarine bases to Knights-Templar strongholds and churches, Croatia has an interesting and varied history waiting to be explored. Roman architecture is well preserved in the heart cities like Split and Pula, and several Stone Age sites have been discovered all over the country. The Bosnian War is the most recent piece of Croatia’s complex history, but now, almost 2 decades since the war ended, Croatia is established as a strong, safe and independent country that is part of the European Union with some of the best sailing in the world. Did we mention that already? Well the sailing in Croatia is some of the best in the world, so it’s worth mentioning twice! Plus it’s what we do… No group is too big or too small, just get in touch today and we’d love to help you organise the summer of a lifetime in Croatia! WE OFFER A FULLY BESPOKE CHARTER SERVICE; TAILORING YACHTING HOLIDAYS FOR YOU, YOUR FRIENDS OR FAMILY. WE CAN ACCOMMODATE ANY AMOUNT OF PEOPLE, ON ANY NUMBER OF YACHTS – THE POSSIBILITIES ARE MORE THAN ENDLESS TO CREATE AN UNFORGETTABLE EXPERIENCE.